It's not usually necessary to take full measurements for baby clothes. A picture instructing the measuring is included for cases when custom measurements are required. First, the macro asks you to choose a standard size based on your baby's height. You have to choose a size even if you plan to type in custom measurements. Select the choice that is closest to your subject's height. The next dialog box shows you the standard measurements for that height. (Some of the macros have two dialog boxes for measurements.) To accept these measurements, just click the "OK" button. If you want to use custom measurements instead, enter the correct numbers and then click "OK". We do not include an ease chart for the babies' garments because it should not be necessary to adjust ease much for babies' clothing. Baby clothes are deliberately designed for a loose fit. Some macros give you a choice of "Normal" or "Wide" ease, and some select the ease automatically. Wide eases are for garments with very loose fit, or for outer garments that are to be worn over other clothes. Enter the correct measurements, and the macro will add the ease. Check that waist, neck and cuff ribbings are of suitable length. The correct length depends on how elastic the ribbing fabric is. Sew and overlock shoulder seams with right sides together (Picture 1). Join sleeves to shell, right sides together (Picture 2). Overlock. Sew sleeve seam and side seam continuously from sleeve cuff to shell hem, right sides together (Picture 3). Overlock..
Sew ends of waist ribbing together, to form a ring. Fold lengthwise in two, wrong side inside. Divide the circumference of the ring into four equal parts and mark them with pins through both layers on the cut edges. Do the same with the bottom of the shell. Then pin together corresponding marks and stitch (Picture 4), stretching the ribbing to fit. Shell should be inside out now, and the ribbing is inside it. Sew and overlock. Attach neck and cuff ribbings in the same way. The dress illustrated is constructed with a placket in front. Variations can use buttons or a back closure (zipper or buttons). If you want to sew a collar on the dress, refer to general sewing instructions and leave out the neck facings. Sew front center seam from hemline to where the button placket begins (Picture 1a). Fold button placket right side inwards and sew bottom edge from fold to center front . Cut seam allowances diagonally here (Picture 1b). Iron interfacing to pocket pieces (Picture 1c). Turn seam allowances inwards and baste. Topstitch top of pocket. Sew pockets to their places on front pieces simultaneously edgestitching them. The exact location of the pockets is a styling decision for you to make. Sew and overlock shoulder seams (Picture 2a) and side seams (Picture 2b), right sides together. Easestitch sleeve cap with normal seam allowance (Picture 3a). Sew and overlock sleeve seams. Turn shell wrong side out and sleeves right side out. Place sleeves inside shell (Picture 3b) and match sleeve shoulder marks with shell's shoulder. Pull the ends of the edgestitching threads to gather ease in. Sew and overlock. Sew and attach sleeve cuffs according to general sewing instructions . Fold hem allowance twice and sew. Sew buttonholes. Sew on buttons. For the body of the shirt, follow the sewing instructions for man's shirt . Use general sewing instructions to attach collar and sleeve cuffs. Fold hem allowance twice and sew. Sew buttonholes. Sew on buttons. Sew center seam at crotch from leg to where zipper placket begins (Picture 1a). Attach zipper according to general sewing instructions . Place pocket lining on top of pants pocket corner, right sides together Picture 1b), and sew along pocket mouth (Picture 1c).. Snip seam allowance at intervals of about 3/4 in (2 cm). Turn facing inside and topstitch pocket mouth twice. Place pocket side body piece under pocket lining piece edges matching (Picture 2). Sew and overlock along round and bottom edges. Pocket side seams are attached to the pants' side seam when sides are sewn. Sew back waist dart. Sew center back seam, with elastic stitches if possible (Picture 3). Place front and back pants on top of each other, right sides together, and sew along side seams (Picture 4a) and leg seams continuously from cuff to cuff (Picture 4b). Fold front pleats soft and pin. Attach waist band according to general sewing instructions . Fold cuff seam allowances twice and sew. Sew button and buttonhole on waistband. For pants with elastic waist band use pants' macro version 2, (bpants2.mac, cpants2.mac). Omit zipper and back darts. Sew ends of waistband together to form a ring. Overlock one long edge and sew other edge to pants waist, right sides together. Press seam allowance upwards. Fold waist band horizontally in two and sew along previous seam line. Leave a hole for inserting a rubber band. After inserting a rubber band close hole. If you want to sew jeans (cjeans.mac, only for children over 2 years), sew and overlock back yoke's back seam and back pant's back center seam. Sew and overlock yoke to pants, right sides together. Topstitch seam twice. Put decorative stitching, if desired, on back pockets now and then attach them. Topstitch leg seam (from cuff to cuff) twice. To be able to do this, sew side seams only after you have done this. Otherwise follow sewing instructions for normal pants above. Sew side pockets to front pieces according to general sewing instructions . For the body of the sweater, follow the instructions for T-shirt but do not attach ribbings. Sew and attach hood according to general sewing instructions . Make small buttonholes in front piece, on both sides of center front and 2 - 1/2 inches (6 cm) from bottom edge. These are the holes for the drawstring. Strengthen buttonholes by ironing interfacing to wrong side of fabric, then sew buttonholes. Fold hem allowance inwards 1 - 1/2 inches (4 cm) and sew on right side with twin needle to form a tube for drawstring. Fold sleeve ends inwards and sew on right side with twin needle. Overlock all edges of yoke pieces for shoulder and neck seams. Do the same with the front piece edges to which yoke is to be joined. Fold button plackets of front yoke inwards along fold line. Fold front piece's yoke seam allowances inwards and baste (cut seam allowance diagonally at corners to allow it to fold). To strengthen the corner to be cut, sew line of stitches around corners at width of seam allowance from edge. Place yoke pieces are on top of each other so that their center fronts match (= button plackets on top of each other). Then place front piece on top of the yoke. Baste and sew yoke to front piece, simultaneously edgestitching it. Sew and overlock shoulder and side seams of shell and armscye facings. Place facings onto armscyes of shell, right sides together. Sew and overlock. Snip the seam allowances at 3/4 inch (2 cm) intervals. Turn facings inwards and edgestitch. Hand sew facings with small stitches to shell's shoulder and side seams. 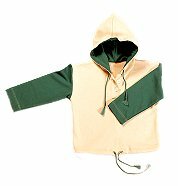 Sew and attach hood according to general sewing instructions . Make small buttonholes in front piece, on both sides of center front and 2 - 1/2 inches (6 cm) from bottom edge. These are the holes for the drawstring. Strengthen buttonholes by ironing interfacing to wrong side of fabric, then sew buttonholes. Fold hem allowance inwards 1 - 1/2 inches (4 cm) and sew on right side with double needle to form a tube for drawstring. Iron interfacing to outer half of the button plackets and pocket pieces. Sew front center seam from leg seam to where button placket begins (Picture 1a ). Fold button placket right side inwards and sew bottom edge from fold to center front (Picture 1b). Cut seam allowance diagonally at center front(Picture 1c). Turn out. Place button plackets on top of each other, center fronts matching, and sew over bottom edge though all layers of fabric. Turn the seam allowances of the pocket pieces inwards and baste (Picture 1d). Topstitch pocket mouths. Sew pockets to their places on front pieces, simultaneously edgestitching them. Sew back center seam, with elastic stitches if possible (Picture 2). Place front and back pieces on top of each other, right sides together. Sew side seams (Picture 3a). Sew leg seam continuously from cuff to cuff (Picture 3b). Iron interfacing to the wrong sides of the facings. Sew side seams of facings. 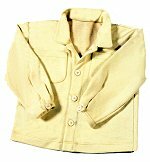 Fold button placket along folding line, right sides together (Picture 4a). Place facings on it on overall's neck, right sides together. Sew along top edges continuously from center front, around shoulder strips and along armscyes to back shoulder strips etc. (Picture 4b). Sew buttonholes to back shoulder strips. Sew buttons on front shoulder strips. Fold leg ends two times and sew. If you sew an overall with sleeves follow the sewing instructions for T-shirt to sew top part of the overall. 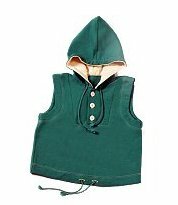 For patterns with hoods, attach hood according to general sewing instructions . Attach sleeves according to instructions given for T-shirt.